Public artwork in Newham - Crossrail . For information about the Elizabeth line please visit the Transport for London website. 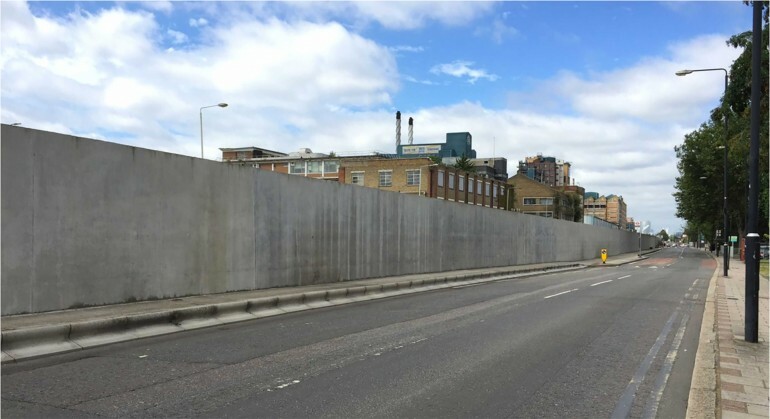 The community of Newham is working with a local artist to design an artwork that will be installed on the Elizabeth line trackside wall that runs through Custom House, Silvertown and North Woolwich. Artist Sonia Boyce is working with the community to create an artwork that will be applied to the Elizabeth line trackside wall, running through Custom House, Silvertown and North Woolwich. Sonia has a close relationship to the area. She grew up in Canning Town, studied in Plaistow, and taught at University of East London. She would often visit her mother who worked in Custom House. Sonia is creating a unique artwork for Newham and it will reflect the many stories from and of the local area. Last year Sonia ran workshops training local young people from Shipman Youth Centre, Fight for Peace and ASTA Community Hub to record and archive oral history interviews. These young people have undertaken interviews with the local community and the results will become material for Sonia’s artwork. The final design for the artwork will be unveiled later this year. Over her 30-year career Sonia Boyce has emerged as one of the leading figures in the British art scene. Her work began with drawings that reflect her personal experiences to more recent works in which she uses diverse media such as photography, video, sound and testimonies to depict contemporary life. Boyce's recent interests explore art as a social practice and the critical and contextual debates that arise from this area of study. With an emphasis on collaborative work, she has been working closely with other people since 1990, often involving improvisation and spontaneous performative actions on the part of her collaborators. After gaining recognition in the 1980s as part of the Black British Artists Movement, Sonia’s practice has evolved to become more collaborate and site specific, integrating all mediums including film, performance, photography and installation. In 2007, she was awarded an MBE for services to Art, and in 2016 she became a Royal Academician. She has exhibited at the ICA London, Eastside Projects in Birmingham, and the 2015 Venice Biennale. Last year Sonia won the Paul Hamlyn Foundation Award for Artists. The Newham Commission will be Sonia Boyce’s first permanent public art commission in the UK.